"Scientists and economists have figured out ways to put a price on carbon pollution. Getting a handle on the societal costs of climate change means those costs can be integrated into decisions by agencies and other groups," said study author Bonnie Keeler, IonE program director and lead scientist with the Natural Capital Project, a partnership of the University of Minnesota, Stanford University, The Nature Conservancy and the World Wildlife Fund. "We currently don't have a handle on the costs of nitrogen and as a result the damages caused by nitrogen are not incorporated into decisions." "Our work shows that it is possible to get a better handle on the costs of nitrogen and show where investments in mitigating damages from excess nitrogen are most likely to benefit communities," said Keeler. "Ultimately, I'd like to see agencies start incorporating the damage costs of nitrogen into payment schemes, conservation programs, commodity prices or new regulations, just like we are starting to do for carbon. 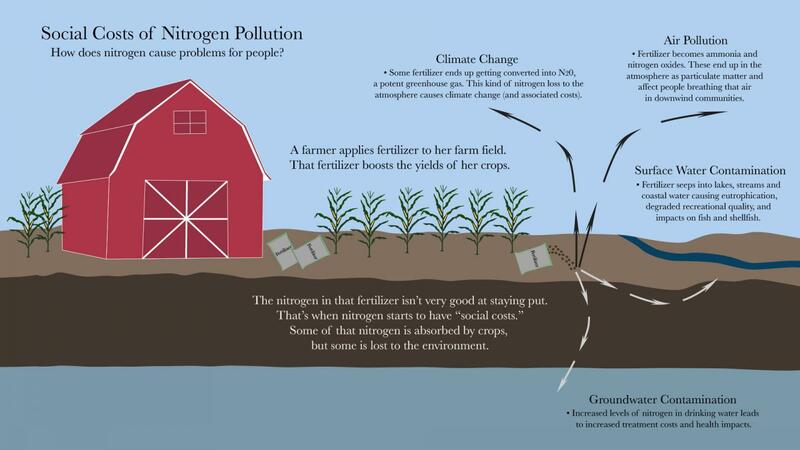 In the meantime we're getting a lot closer to closing the loop on nitrogen impacts."